Here’s another way you can add some color and flavor to rice. 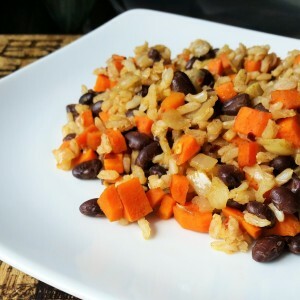 In addition to being flavorful, this recipe includes black beans that add a little extra protein. The dish is gluten-free, vegan and ideal for meal prep. Try it with our MBMK style steamed broccoli. 3. While rice is cooking, heat oil in large skillet on medium heat; sautee carrots for about 5 minutes until soft. 4. Add onions and garlic to carrots in skillet and cook for 5 minutes until onions are translucent. 5. Stir in drained black beans, thyme, cumin, cinnamon, red pepper flakes and honey; cook for about 2 minutes. 6. Add cooked rice to vegetables and mix well. 7. Add salt and black pepper to taste. * If using canned black beans, lightly rinse and drain beans before adding them to the rice.